December 18, 2018 Fallout 76 players will get their canvas bags. Eventually. 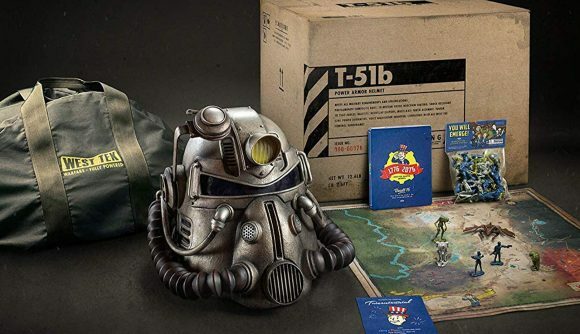 Fallout 76’s canvas bags are finally heading to players who pre-ordered the game’s Power Armor edition. The catch? It’ll take another four to six months for those bags to actually arrive. Allow me to provide some context. In the wake of Fallout 76’s release, players who pre-ordered the game’s special Power Armor edition back in the summer realised that the nice canvas bag that they’d been promised had been quietly replaced by a cheap nylon bag that cost less than a dollar. When those players complained, Bethesda said that it didn’t have any plans to address the issue. To help them deal with that wait, players have once again been offered around $5 of premium currency – the same consolation prize handed out after Bethesda said they wouldn’t be getting a canvas bag at all. An unrelated, as-yet-unfiled class-action lawsuit against Bethesda alleges that the company is guilty of deceptive trade practices around Fallout 76, especially given players’ limited ability to get refunds on the game from the Bethesda launcher. Whether that case will actually be filed and brought to court remains to be seen.